It’s no secret that Pixar has gotten into the sequel business as of lately. They’ve made some terrific sequels to already great films (the Toy Story franchise) and some absolutely dreadful sequels to one of their rare-misfires (Cars). Luckily, I’m happy to report that Finding Dory lands in the former of Pixar sequels. The film, which has come to fruition 13 years after Andrew Stanton‘s Oscar-winning original became an instant classic with families and children. Children such as myself grew up watching the film, along with many other great Pixar flicks. I can’t say Finding Nemo was my favorite Pixar flick (I have a soft spot for the Toy Story films, The Incredibles, Up, and Inside Out), it was a very well made and beautiful film about a father-son relationship. This time around, the film revolves around the neurotic fan-favorite Dory, as she goes looking for her family. 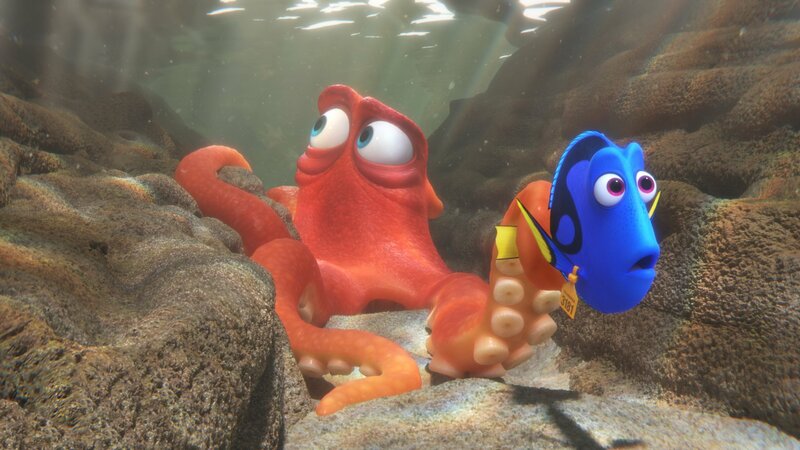 As many fans would know, Dory (Ellen DeGeneres) suffers from short-term memory loss, and can’t remember things even after they occured. We find out in the opening that Dory had completely forgotten about her parents (Diane Keaton and Eugene Levy) when she was a kid, and convinces Marlon (Albert Brooks) and Nemo to swim all the way to California to find her parents. Unfortunately, Dory gets swept up and trapped in a massive aquarium off the California coast, and Nemo and Marlon must figure out a way to get their friend back. Andrew Stanton, coming off his disastrous live-action debut in 2012’s John Carter, returns to his Pixar roots to direct the film. Finding Dory could’ve potentially been an annoying cashgrab to shoe-horn in a story involving the fan-favorite (albeit pretty annoying) character of the original film, but Stanton and company come up with a pretty compelling and worthy follow-up. The journey itself is pretty exciting and heart-wrenching, and some of the more emotional moments in the film are flawlessly handled. I didn’t weep like I did in last summer’s Inside Out, but I got close to doing so. The filmmakers know the right moments and beats to pull and your heartstrings, and its all very effective and emotional for the moviegoer. The voice cast in the film is very impressive, among the talent listed above, we get some fun appearances by Ed O’Neil as an octopus that befriends Dory, Ty Burrell and Kaitlyn Olsen as whales from Dory’s past, Dominic West and Idris Elba (Wire reunion!!) as two sea lions, and so on. Like all of Pixar’s voice-casts, everyone fits their roles perfectly and are all very good in their voice performances. DeGeneres is the stand-out in the film, adding all sorts of levity and depth to her character from the original. It’s a terrific performance, and makes me feel like a snob for underestimating the value of this character. It’s also nice to know that Pixar can make good sequels to good movies other than the Toy Story films. The sequels don’t have to just be cynical cashgrabs like Cars 2. They can be expertly made films that are almost as well-made as the original. I’ve been anxiously awaiting The Incredibles 2 for years now like the rest of you, and Finding Dory makes my hopes for Pixar’s future even more optimistic (although I can’t say the same for Cars 3). I’d recommend you see Finding Dory, but I’m pretty sure you and your family have already done so. The film now has the record for the biggest opening ever for an animated film at 136 million dollars (Sunday estimates according to Box Office Mojo), so do what you will with that. If any of you need any convincing, Dory is a wonderful addition to the Pixar filmography, and one of the best family films of 2016 (I’m counting Hunt for the Wilderpeople as a “family film”. Fight me on that if you must). Speaking of which, Hunt for the Wilderpeople, one of the best films of the year, is being released in the States (finally!!) next week. I’m not sure if its being released in Austin, but I can’t recommend that film enough to you. It’s not really a kid’s film, but its the best kids film of the past couple of years. Trust me. Go see it. Oh, and go see Finding Dory too if you want. But support indie film too! !